On the 21st June, the longest day of the year, 29-year-old Jonathan Stoddart will be undertaking the longest run of his life. Jonathan, originally from Yarm and now living in Gosforth, Newcastle, is a clinical trials officer in the Sir Bobby Robson Cancer Trials Research Centre at the Northern Centre for Cancer Care, Newcastle. Alongside friend James Redpath, also from Gosforth and a teacher at Ashington High School, Jonathan will be taking on The Wall, a 69 mile ‘ultra run,’ to raise funds for the Sir Bobby Robson Foundation. Jonathan says: “James and I are both keen hockey players and were looking for a challenge to help keep us fit during the summer. “Neither of us has ever run this far before, and I’ve never even entered an organised run before, so it’s going to be a real challenge. As a clinical trials officer in the Sir Bobby Robson Centre, Jonathan is part of the dedicated team working with patients from across the North East and Cumbria who are undertaking clinical trials of new cancer drugs. He has been working at the centre since Sir Bobby officially opened it in 2009. 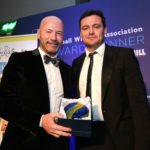 Jonathan adds: “I’m privileged to be in a position to see the work the Sir Bobby Robson Foundation helps fund every day. “It means a lot to me to be raising money for the charity and it will be in my mind as I run. The Wall is an on and off-road ultra-run through Hadrian’s Wall country, starting at Carlisle Castle and finishing at Baltic Square, Gateshead, after crossing the Millennium Bridge. Created by Rat Race, the UK’s leader in adventure sports events, and launched in 2012, the event has more than 1,000 entrants this year. Participants can attempt the challenge as one single 69 mile stage, as Jonathan and James are doing, or over two days. 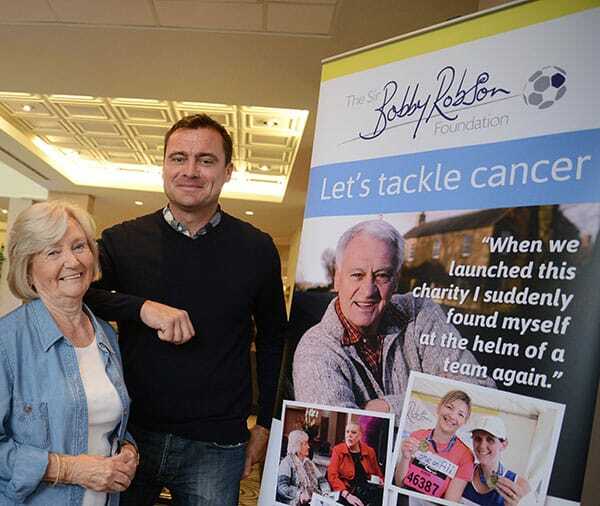 On behalf of the Sir Bobby Robson Foundation, Lady Elsie says: “It was a great pleasure to meet Jonathan and James recently to find out more about this challenge. They’re both lovely young men and so committed to raising money for our charity. “It’s certainly a very long run but they talked me through their training and it sounds like they’re very well-prepared. “I’m sure Bob would have been fascinated to hear how they are approaching things. Especially getting the right fuel on board during the run. Sir Bobby launched the Sir Bobby Robson Foundation in 2008 to help find more effective ways to detect and treat cancer – including the clinical trials of new drugs. It funds projects that directly benefit patients from across the North East and Cumbria and which contribute significantly to international efforts and research into fighting cancer. To sponsor Jonathan and James, please visit www.justgiving.com/Jon-Jam.